This photo was taken in August 14, 2014 at 5:05 PM. The "Take It!" 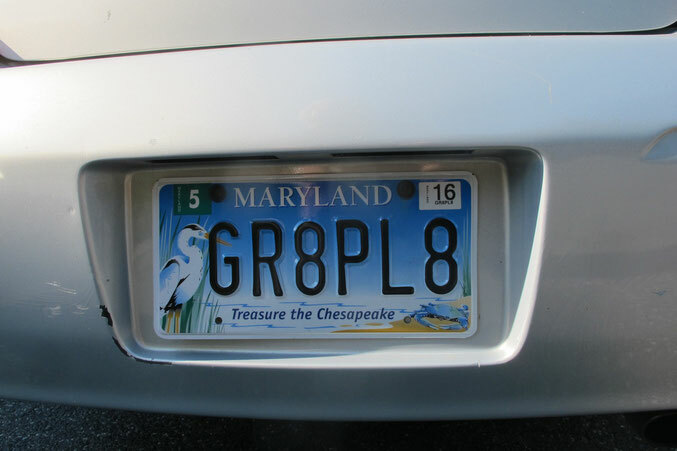 arrived after finally getting used to having this plate on my car after finally applying for it at the DMV in Maryland two months ago. I had thought of having this letter and numeral combination about 10 years ago and did not act upon it. It was a combination of being busy, not having a vehicle to put it on even if I did get it, and last but not least the most awful reason " It is probably already taken " which I hate to confess I entertained. It was time for renewal of my ever so standard licence plate on my second car which is a Toyota Solara. I went to the DMV and was assisted at a kiosk by one of the employees in making my selection. I had several choices written down just in case my first choice was taken. I had told the lady assisting me the story of having thought of this about 10 years ago so we both stood there in anticipation while the computer did its thing to search availability. Both of us were quite taken when it came back with the affirmative answer for this selection. She said she rarely had seen someones first choice come back for them like this one did. It was a hoot to thank her for her congratulations. The After Take: This was a throw back to childhood as I waited for the plates to be delivered to my house via the post office. The daily "has it arrived?" question was yet another hoot to engage in. One hears the story of how licence plates are stamped and made in prisons. I do not know if this is the case here in Maryland. However - if indeed it is how they are made - I hope the inmate got a laugh out of seeing this one come to life via their guiding hand. If there was a way to send a note thanking them for their good work - I would indeed send one off. Now having achieved some degree of comfort with having the plate I am happy enough with the message and hope that others get as much of a kick out of it as I do. It is not intended to trump all others - just be a player. Here is hoping this photo brings a smile to your day. Those are way cooler than California plates. lol those are cool plates. I've always wanted to get custom plates but I cant think of anything original. Those are fun. I always enjoy trying to decipher the meaning behind custom plates, some are very straight forward, others not so much. These look easy enough to grasp and bring a smile to someone like me.